It's no secret - ICOs are all the rage these days. Many new companies are raising millions of dollars by selling their tokens in crowdsale. If you are reading this article, you are probably pursuing the idea of doing an ICO. I wrote an article a few days back where I explained how one can quickly create their own tokens and sell them in an ICO. Although it offers good insights into ICO Contracts, it omits many real word aspects such as presale, public sale, discounts, security etc. Update: I'm writing a book on Ethereum Smart Contracts. It's available for purchase on LeanPub. If you are interested in learning more about Smart Contracts and ICOs, feel free to give it a try. The corresponding codebase is available on GitHub. Feel free to clone it and play around. Truffle framework is the easiest way to build and test decentralized apps/contracts. I assume you already have node 8. If not, use nvm to install node 8 (with nvm you can maintain multiple node versions). Now truffle is installed as a global node module. Ganache lets you run a personal Ethereum blockchain on your computer. This is where you will deploy your contracts while testing locally. Head over to Ganache website to install the latest version for your platform. Once downloaded, install the software and click on the app icon to run it. As the name suggests, all your Solidity source files go inside contracts/ directory. After you compile your files for the first time, you can see a build/ directory which contains all your compiled code. Due to the above reason we'll use a library called Open Zeppelin. It has a bunch of well tested and secure Crowdsale/Token contracts. Instead of writing ERC20 tokens and Crowdsale contracts from scratch we'll use Open Zeppelin as a base contract and build upon it. At the time of writing I am using zeppelin-solidity@1.5.0. The above command should install the zeppelin-soliditypackage inside node_modules. 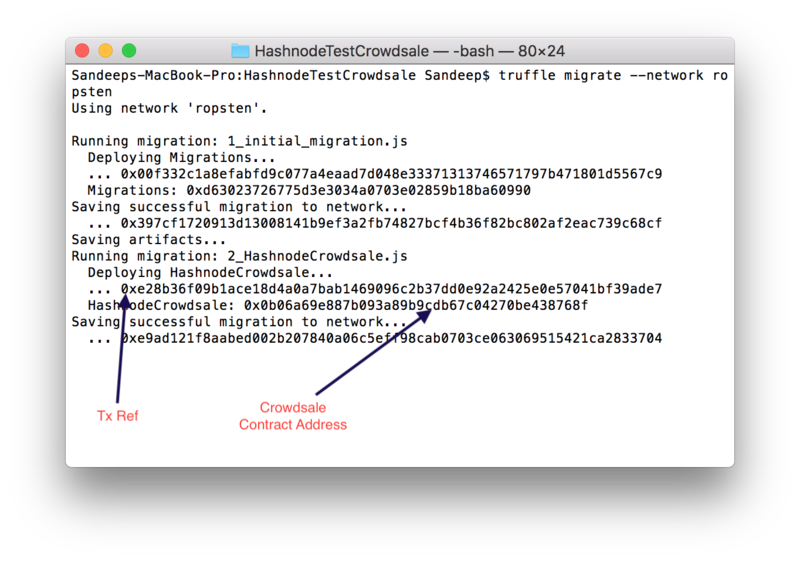 You can find the token & crowdsale contracts inside node_modules/zeppelin-solidity/contracts directory. We'll import these from our own solidity code. As you may have guessed, we are just extending MintableToken provided by zeppelin-solidity package. MintableTokenitself inherits ERC20 token contract (find it inside zeppelin-solidity/contracts/token/ directory). So, the end result is that our new token HashnodeToken is an ERC20 token. MintableToken means that the total supply of the token starts with 0 and increases as people purchase the tokens in the crowdsale. If you decide to create 100 tokens and sell 60 of them in crowdsale, the supply will increase up to 60 (as people pay ETH and buy the tokens). Once the crowdsale is over, 40 more tokens will be minted making the total supply 100. Feel free to change the above code and supply appropriate values for name and symbol. It's recommended to set the decimals to 18 in order to be standard compliant. Our crowdsale contract inherits CappedCrowdsale and RefundableCrowdsale (supplied by zeppelin-solidity) and therefore has a goal and a hard cap. If the contract isn't able to raise a certain minimum amount of ETH during the crowdsale, the ETH amounts will be refunded to the investors. Similarly, the contract will not be able to raise more than a specific amount of ETH due to a hard cap. Total 100 tokens will be created by the end of the crowdsale. Out of 100, 60 will be sold in the crowdsale. Once the crowdsale is over, rest 40 tokens will be (minted and) divided among three wallets such as teamFund, ecosystemFund and bountyFund. The crowdsale has two stages: PreICO and ICO. You can change the stage and update rate variable to offer extra discounts during presale. As per the above crowdsale contract 1 ETH can buy 5 tokens in PreICO and just 2 tokens in public sale. So, the early investors get extra discounts. Note: Max 20 tokens will be sold in PreICO. When PreICO is live, the incoming ETH amounts are immediately transferred to the beneficiary wallet (supplied while deploying the contract). However, in the public sale the raised ETH amounts are sent to a refund vault. If the crowdsale reaches its goal, the funds are transferred to the beneficiary wallet. Otherwise, investors are allowed to claim refunds (check zeppelin-solidity/contracts/crowdsale/RefundVault.sol). You have to call finish() to close the crowdsale. This is where remaining tokens are minted and distributed among various reserved funds. Note: Any unsold tokens are added to the ecocystem fund. Each it() block introduces a scenario and performs some actions on the contract to verify that the code is behaving as expected. I have written total 9 test cases. Feel free to think of more scenarios and write the corresponding tests. "0x5AEDA56215b167893e80B4fE645BA6d5Bab767DE", // Replace this wallet address with the last one (10th account) from Ganache UI. This will be treated as the beneficiary address. We need to do the above modification so that we can set crowdsale start date to yesterday while deploying. Otherwise you have to provide a future date as the crowdsale start date which will be difficult to test. Ganache (installed earlier) is running on port 7545. The above code configures the local blockchain (Ganache) details and registers with truffle. Now it's time to compile, deploy and test our code. Do note that truffle test command automatically compiles and deploys your contracts before running the tests. Congrats! You have verified your contract on your local machine. Now let's go one step ahead and deploy our code to Ropsten TestNet. In order to do that we need an ethereum wallet. For the sake of simplicity let's use MetaMask (also my personal favorite). So, go ahead and download the extension for your browser. Currently, it's available for Chrome, Firefox, Opera and Brave. Once you have installed MetaMask, choose a password and note down the 12 word seed phrase. Also, buy some test Ether by clicking on "Buy" button in MetaMask. It'll take you to a faucet where you can request some test ETH. We'll need this to pay our transaction fees while deploying the contract. var infura_apikey = "KbQuP7xkP1ZYNhJkUOXF"; // Either use this key or get yours at https://infura.io/signup. It's free. Replace the variable mnemonic with the seed phrases obtained from MetaMask and run npm install. We did this so that truffle chooses the first account created on MetaMask to deploy the contract. Congrats! Your crowdsale is now live on TestNet. Note the contract address and Tx ref. You can go ahead and test all the 9 scenarios on Ropsten. But for the sake of brevity, let's conclude this article with just 1 test which is: If I send 1 ETH to the Crowdsale Contract, I should get back 5 HTs. So, open up MetaMask and send 1 ETH to the contract address. 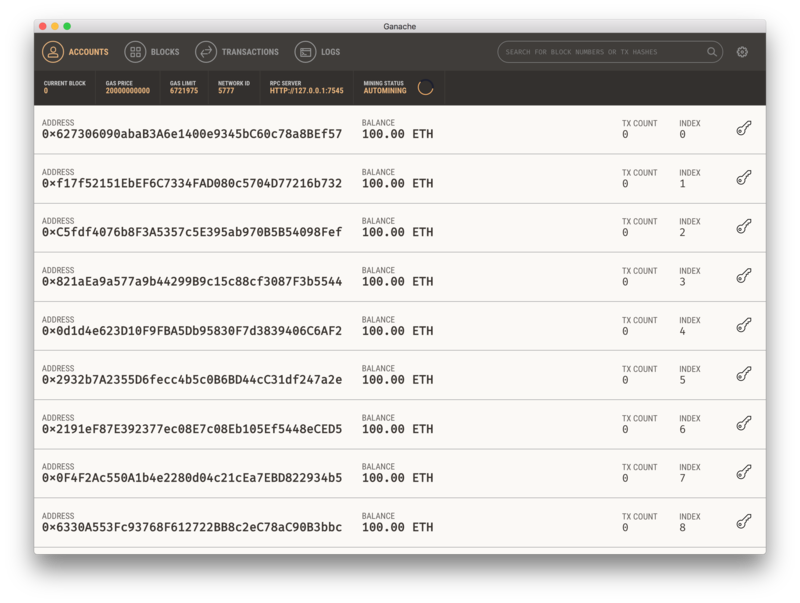 Once the transaction is complete (you can check the status on Etherscan), go to the tokens tab of MetaMask. MetaMask doesn't show all your tokens by default. You have to add the specific token in order to see your balance. At this time we just have the crowdsale contract address. So, how do you get the ERC20 token address? If you look at the contract code, you will see that there is a public variable token defined in zeppelin-solidity/contracts/crowdsale/Crowdsale.sol';. This is the address of your ERC20 token. So, how do we read its value? It's simple. 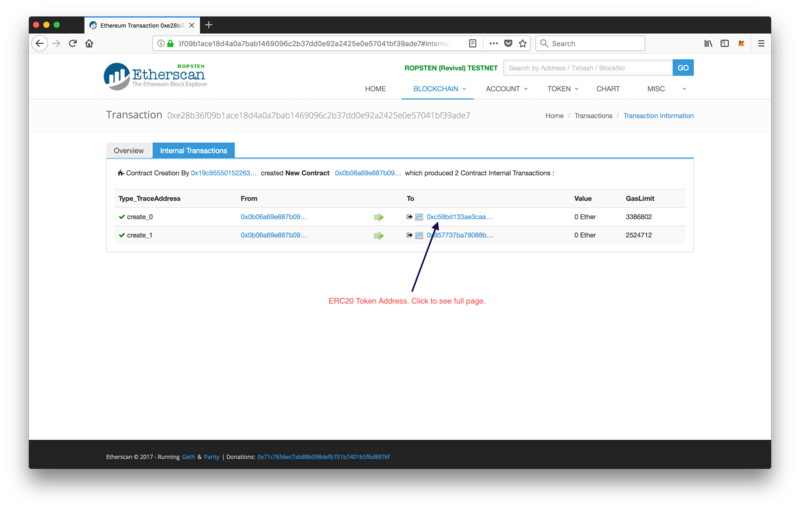 As the contract HashnodeCrowdsale automatically deploys HashnodeToken, you can find its address from the internal transactions tab on Etherscan. Replace txRef with the Tx Ref we noted earlier. Once the page loads click on the "To" address of the first row. It'll take you to a new page where you can see the Contract Address. Note the address. Now go to MetaMask -> Tokens -> Add Token. Paste the token address. The symbol and decimals will be populated automatically. Hit Add and you are done! If everything worked correctly, you should see 5 HTs in your account. In case you don't see it immediately after adding the token, refresh MetaMask. Sometimes MetaMask UI doesn't update after adding a new token. Feel free to check all possible scenarios and let me know your findings in the comment section! If you spot any errors or inaccuracies, please report them in the comments - and as always feel free to ask any questions. Happy to help! One of the best out there! Hashnode will pass Stack in no time. Great write up, works perfectly. Well done! What is involved in getting this to mainnet, just changing the network? Also, for anyone else trying out this tutorial but are using the latest version of zeppelin-solidity, I have found the following changes helpful. (2) If you are unable to deploy the contract because of a gas issue, try updating the gas amount in truffle.js to reflect the limit in ganache. "gas: 6721974"
I've got the same problem as Geo. Any solution? Now... Once the ico is finished, how can I see the balance of tokens that have been returned to the addresses that have participated? Shows me the eth balance, not the token balance. I was looking and analyzing, to see the tokens you must make the query with the api webjs of ethereum making the call with your JSON ABI contract. First of all, thank you very much for this tutorial! As a beginner, I found it very educational and fairly straightforward to follow. However, there is something that I am having trouble understanding. Using the code provided, I am able to purchase 5HTs for 1ETH. Success! This is utilizing "uint8 public decimals = 18;" in HashcodeToken.sol My understanding is that each HT is divisible up to 18 decimals. From what I've read, setting uint8 "public decimals = 0; should create a token that is indivisible. However, deploying the contract with only this change creates far too many tokens! to: uint256 public maxTokens = 100; for all token amounts in the contract. Is this a correct interpretation? If so, I can't seem to work out is how the "rate" should change. 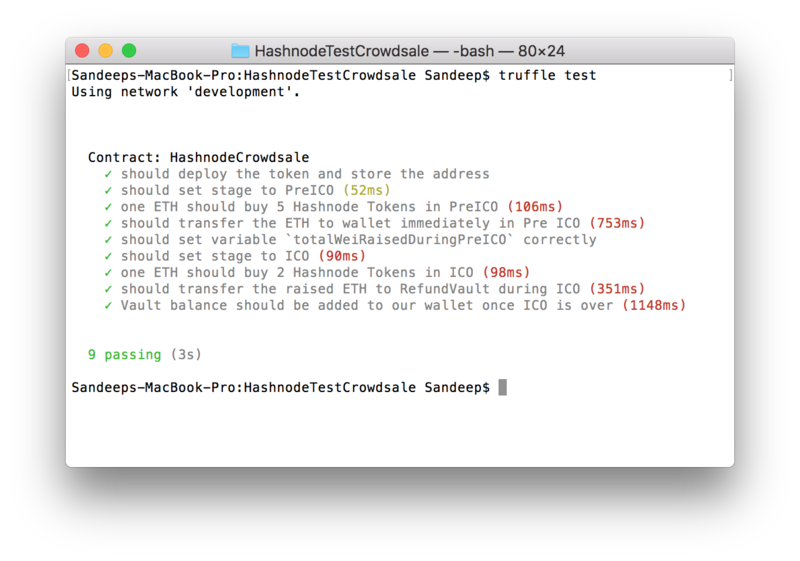 Setting the rate to 0.1 for example returns an error and keeping the rate "as is" creates errors when running the TestCrowdsale. I've tried looking at the documentation but I can't seem to wrap my mind around it! How can I make this HashnodeToken indivisible and what effect does it have on the rate? Any luck with this? I have the same issue and can't figure out what's wrong.